Safety in Numbers is the first book to examine the arguments for and against ratios. Utilizing survey data, interviews, and other original research, Suzanne Gordon, John Buchanan, and Tanya Bretherton weigh the cost, benefits, and effectiveness of ratios in California and the state of Victoria in Australia, the two places where RN staffing levels have been mandated the longest. They show how hospital cost cutting and layoffs in the 1990s created larger workloads and deteriorating conditions for both nurses and their patients--leading nursing organizations to embrace staffing level regulation. The authors provide an in-depth account of the difficult but ultimately successful campaigns waged by nurses and their allies to win mandated ratios. 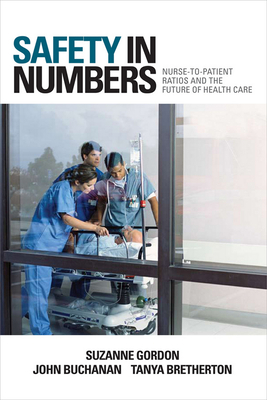 Safety in Numbers then reports on how nurses, hospital administrators, and health care policymakers handled ratio implementation. With at least fourteen states in the United States and several other countries now considering staffing level regulation, this balanced assessment of the impact of ratios on patient outcomes and RN job performance and satisfaction could not be timelier. The authors' history and analysis of the nurse-to-patient ratios debate will be welcomed as an invaluable guide for patient advocates, nurses, health care managers, public officials, and anyone else concerned about the quality of patient care in the United States and the world.